The Angels and Steelers entered Championship Saturday with one thing on their minds: win the Metgot division championship game and prove themselves. The Angels completed their mission and won the trophy after showing a barrage of offense, dominating both sides of the ball for a 33-6 score. The Angels scored an impressive five total touchdowns on the sunny Saturday afternoon. One of these five touchdowns was scored on defense when Alex Sojo made an interception midfield and returned it all the way to the end zone. One of the offensive scores made by the Angels was an outstanding 25 yard touchdown reception made by receiver Vance Meno in the second quarter. Despite having four turnovers, the Steelers managed to get on the board once. This touchdown was made when Irvin White caught a long 60 yard bomb, impressing the crowd on both sides. Other than this touchdown, the Angel defense for all other parts of the game remained sharp and allowed nothing to get past them. “Honestly, this was our best game, and we travelled far to get here,” said Alex Sojo. Wendy’s POG: Vance Meno, Alex Sojo and Caleb Murphy. The first quarter was very productive for the Angels. Two touchdowns were scored in this amount of time.The first one was scored when Caleb Murphy ran eight yards into the end zone, making the score 8-0 after the two point kick. The second one was made while the Angels were on defense. Alex Sojo made a 50 yard pick six, raising the score to 14-0. The Angels made two more touchdowns in the next quarter. Both of these were scored from passes. One was a 15 yard reception made by Sage Castro to make the score 20-0. A Steeler fumble allowed the other touchdown, a 25 yard catch made by Vance Meno, increasing their dominant lead to an even more dominating lead of 26-0, thus putting the mercy rule into effect. The Angels didn’t kick so the Steelers started immediately. Just seconds before halftime, Irvin White Jr hauled in the Steelers lone touchdown: A very beautiful 60 yard reception in the end zone. The Angels scored their final touchdown in the third quarter. This one was made by Caleb Murphy when he ran a solid 15 yards to the end zone. This made the score 33-6 after the extra point was successfully made. The final play of the game was conducted in the blink of an eye. When the Steelers passed the ball, Alex Sojo hopped up to make an interception, sealing the victory. 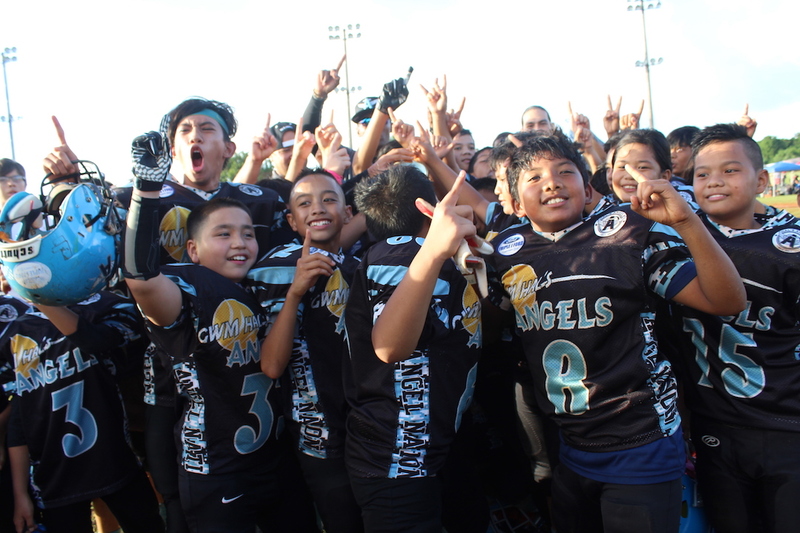 The Angels finished the season undefeated and won the title of Metgot Champions, outscoring the Steelers 33-6.